Captain Albert Evelyn Alderson (Royal West Surrey Regiment attached King’s Own Yorkshire Light Infantry) drowns in Greece. He is the son of the late Reverend E A Alderson, Chaplain to the Forces. 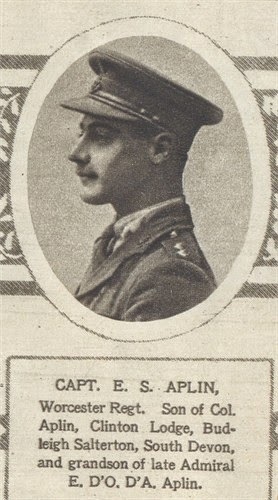 Captain Eric Scott Aplin (Worcestershire Regiment) dies of wounds received yesterday on the eastern slope of Passchendaele Ridge leading an offensive patrol at age 22. His brother died of wounds in May 1915 and they are grandsons of Admiral E D’O Alpin. Lieutenant John Lorenzo Patrick Haynes (North Lancashire Regiment attached Royal Flying Corps) is killed in air combat over Fresnoy Park at age 21. He is the son of the Reverend Canon Charles E Haynes. Private Duncan Atwill (Newfoundland Regiment) is killed at age 21. His brother was killed in July 1916. Bombardier Leonard Spencer Moss (Royal Field Artillery) is killed at age 28. His brother will be killed in August. Private George Ernest Chapman (Devonshire Regiment) is killed at age 21. His brother will be killed in August.